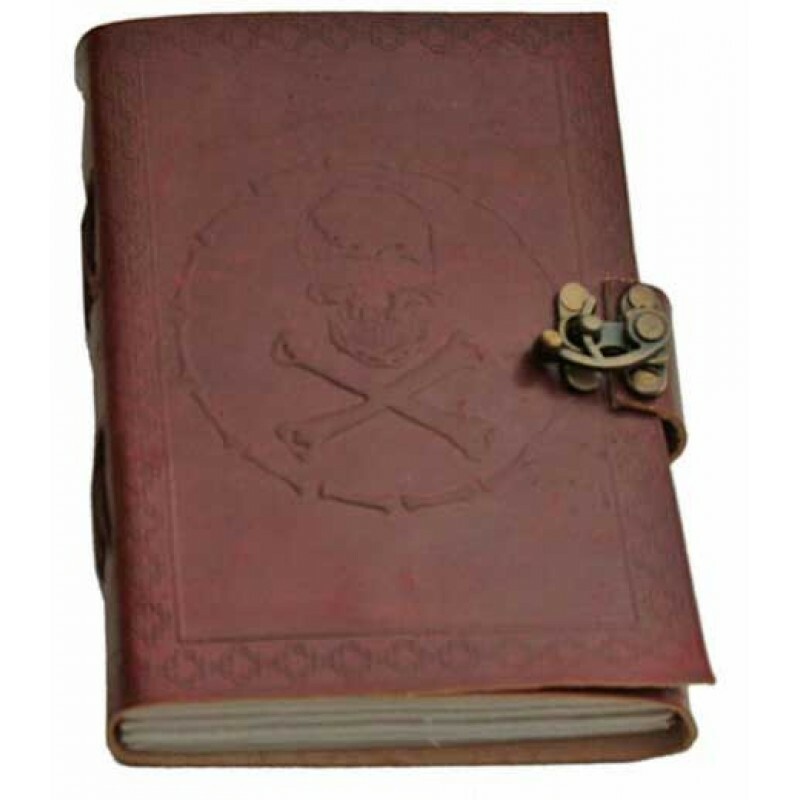 Perfect to remember your Ancestors or those that have crossed over, this stunning journal has an embossed skull and cross bones with brass plated latch. 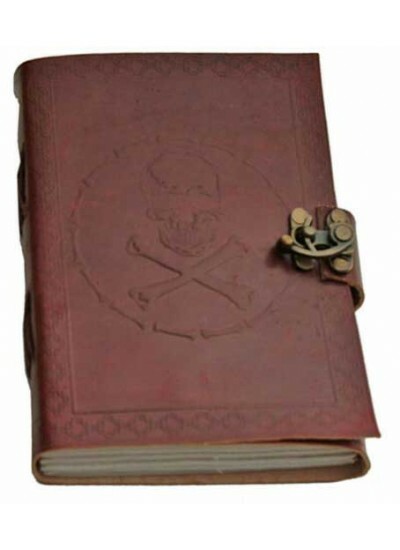 This blank book measures 5 x 7 inches with goat leather cover and about 120 heavy weight pages. Would make a fun pirate book or Halloween prop too. These handmade leather journals are handcrafted one at a time. They all contain acid free, handmade, archival Quality, linen - cotton parchment paper by a family owned company that has been in the handmade paper making business for almost 150 years. The journals contain premium quality handmade linen parchment that passes the most strict of PH - acidity marker test. the environmentally friendly paper is wonderful for all types of media such as water colors, fountain pens or any type of pencils and ball point pens you can think of. Top grade vegetable tanned leather is used throughout the entire line of heirloom Quality, Coptic bound journals. The leather becomes softer and gains character with use and age. One of the great joys about a hand bound Coptic laced binding is that the book always lays open flat, there is never a need of holding down the page so its easy to write in. You can see, touch and feel the quality of each of these journals with the turn of every page. A truly good journal begs the user to write within its pages. Look closely and you will see the beautiful woven linen pattern in the tree free paper of these journals. Vintage, old world craftsmanship and consistent Quality never go out of style, these things become more precious as time marches on. Like your journey and dreams, each journal is unique, so please expect some variation from the photo. Item Number: AA-BBBL590 | Approximate Size (Inches): 5.00 wide x 1.00 deep x 7.00 high | Approximate Shipping Weight: 1.00 lbs.